Le Prince studied with the rococo painter François Boucher and adopted his master's delicate manner and cool, pastel palette in his early work. Dating from late in his career, however, "The Visit" demonstrates a greater naturalism, reflecting the increasing popularity of seventeenth-century Dutch painting in eighteenth-century France. 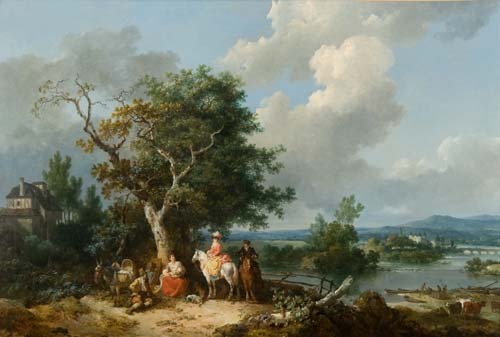 In this canvas, Le Prince has combined a genre scene with a panoramic landscape to suggest a gracious moment in everyday rural life. The subject of nobles visiting a peasant family would have appealed to the sense of humanity cultivated during the Enlightenment.